According to Cleve Gaddis, most real estate agents are doing it all wrong. To count yourself among the top producers of the industry, you must upend the traditional view of the annual calendar and approach your business with the same level of gusto each month of the year. 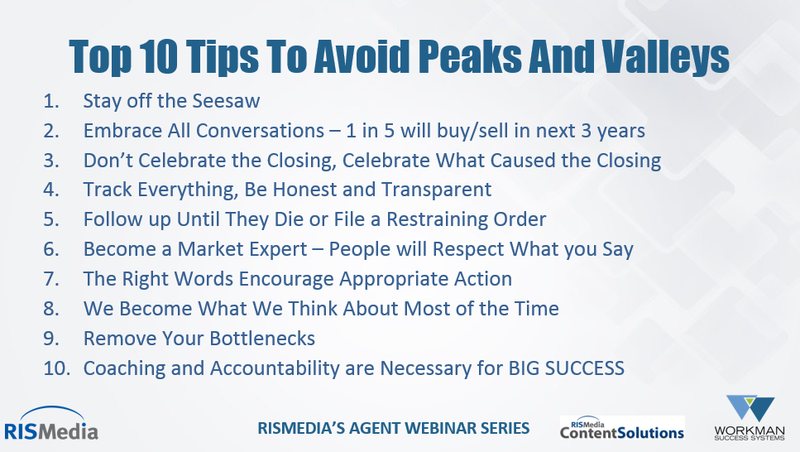 In RISMedia’s latest webinar, “Goodbye Peaks and Valleys, Hello Year-Round Success,” real estate superstar Cleve Gaddis of Gaddis Partners, RE/MAX Center shared with the audience exactly how he has managed to lead one of the top RE/MAX teams in Georgia for 10 consecutive years with $40 million in annual sales volume. 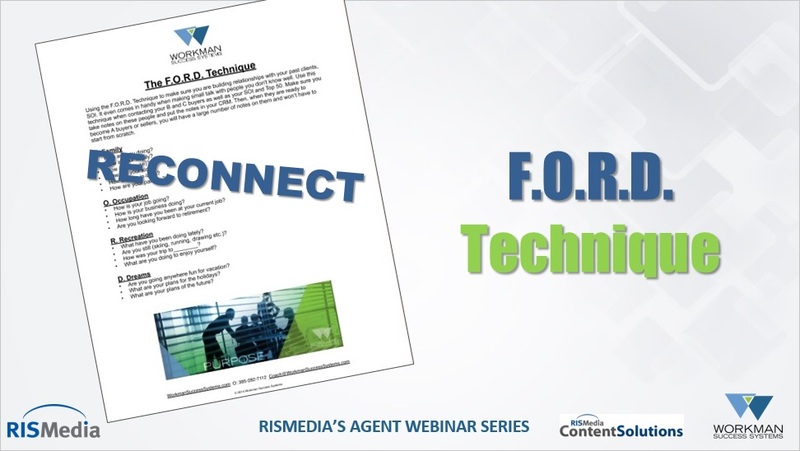 Part of RISMedia’s monthly Agent Webinar Series, the broadcast was moderated by Verl Workman of Workman Success Systems, and sponsored by RISMedia’s Content Solutions. 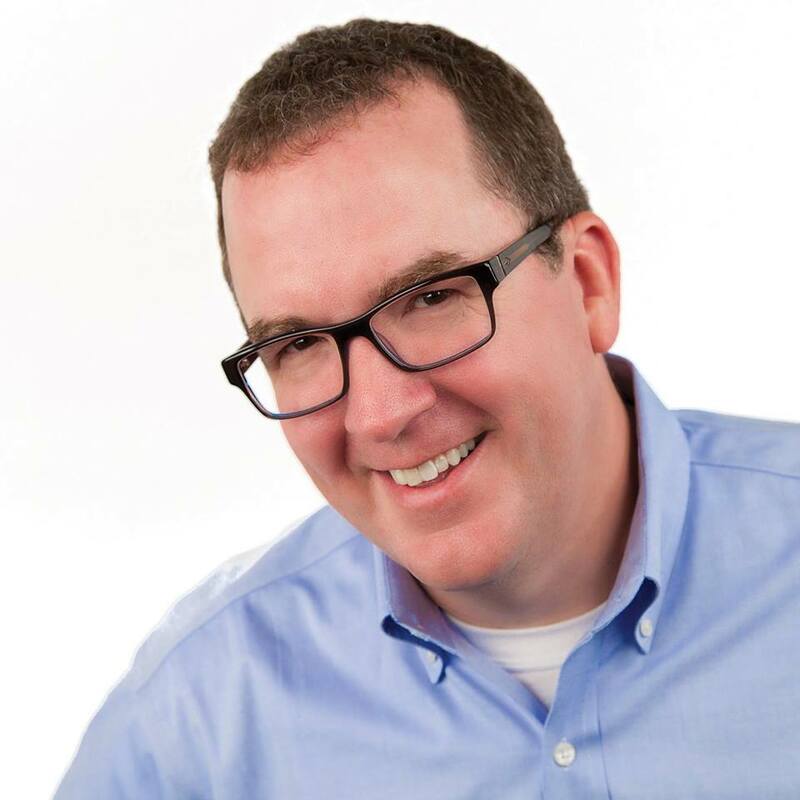 Workman got right to heart of the matter by asking Gaddis exactly what an agent has to do to eliminate and avoid the common peaks and valleys of the real estate business during the course of the calendar year. 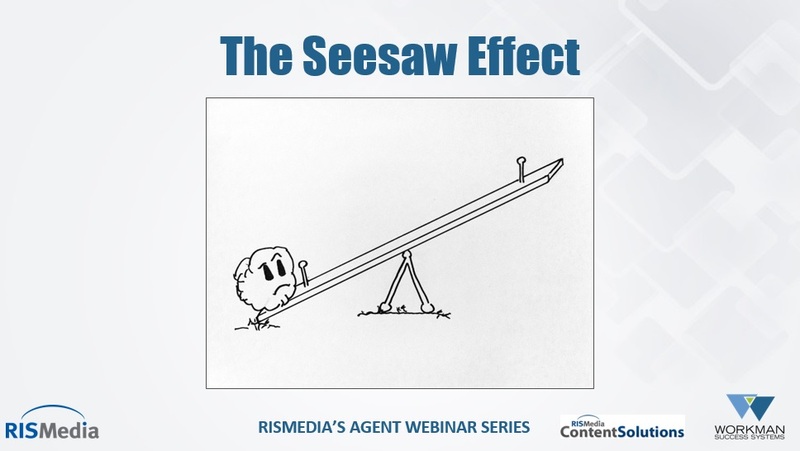 Gaddis pointed to the seesaw effect. 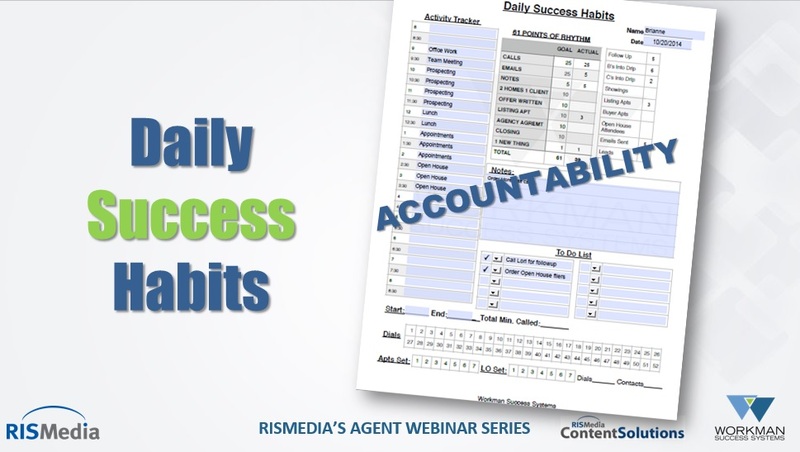 Engaging in conversation is just one of many activities that agents must set goals for, track and be held accountable to each day, no matter what, stressed Gaddis. It’s what he calls the 61 Points of Rhythm, or a daily definition of success. With this method, agents receive points for various daily activities—sending out emails, making calls, mailing handwritten notes, showing homes, setting appointments, etc.—with the goal of accumulating 61 points by day’s end. According to Gaddis determining how many of which activity must be done at what frequency, is a math equation determined by setting your income goal for the year. Your income goal will then break down into the number of daily, weekly and monthly activities that must take place in order to reach that goal. 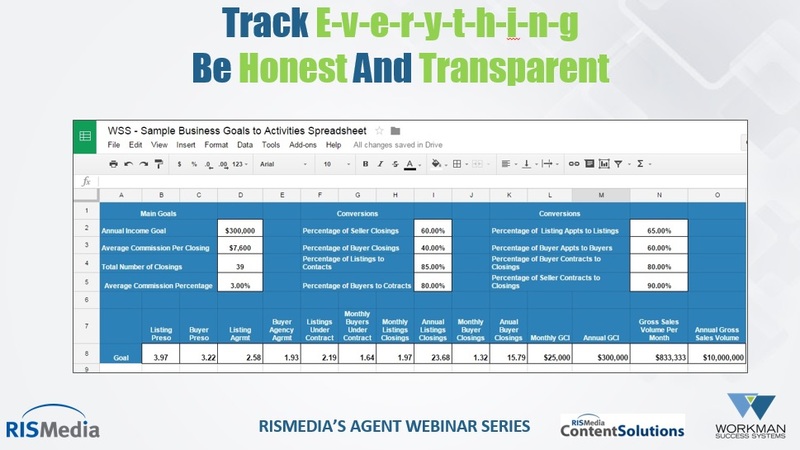 Gaddis shared a spreadsheet with attendees (download it for free here) that automatically calculates an activity game plan for reaching your income goal. To download free copies of Cleve’s spreadsheets and worksheets, click here. Maria Patterson is RISMedia's executive editor. 2 Comments so far. Feel free to join this conversation. Really like the point: “Don’t celebrate the closing—celebrate what caused the closing.” Far too often we don’t pay attention to the process… and the process is always what causes the results. Love this article. Thank you! Should You Buy a House Remodeled Without Permits?